Tea and scones always sounds like a good idea, but how many of you have had the experience of a dry and disappointing scone? I'm not sure why it is, but many scones that I've made, and many that I have ordered as well, are very dry, requiring lots of butter, cream, or lemon curd. Several years ago, my sister sent me a recipe for what she calls "Scrumptious Scones," and they truly are! I never make any other kind now. Don't these look delicious? I looked at my great-grandmother's recipe for scones, and noticed her recipe only calls for 1/4 of the sugar as my sister's recipe. The folks at King Arthur Flour say that the easiest way to add moisture in baking is to add sugar. Who knew? That's probably why sister's scones are tastier than great-grandmother's. Some recipes do call for cream rather than milk, and I imagine that would make a moister scone as well. 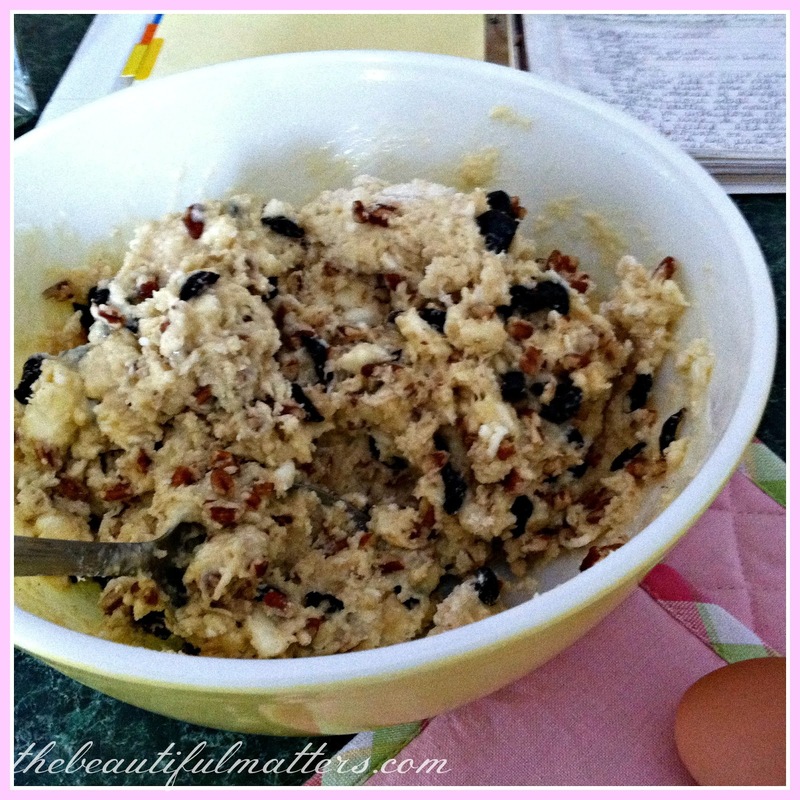 I made my scones with pecans and dried cherries, but you can use whatever you like in them. Orange zest and cranberries would be good; lemon zest and blueberries; apples and walnuts; whatever you like. If you use fresh or frozen fruit, however, add a little more flour to the recipe. I always begin by gathering all my ingredients. That way, I don't get halfway through a recipe only to discover I'm missing an ingredient. As I use things, I put them away. Nothing worse than finishing baking something and having a messy kitchen to clean up. I just clean as I go. I was pleased recently to discover that Argo now makes an aluminum-free baking powder. It used to be that the only brand I could find without aluminum was Rumford, and I sometimes had to go to the health food store to find it. There is some evidence that aluminum might cause Alzheimer's, but it's still controversial. I just know it has a metallic taste to it, and spoils the whole recipe. Not everyone can pick up on this bitter, "tinny" taste; some people, like me, are just more sensitive to it. I love this vintage yellow Pyrex mixing bowl. I don't have a pastry blender, so I just cut the butter into the flour mixture using two table knives. Whisk the milk and eggs together in a separate bowl . . . I cut up the cherries, because I don't like the pieces to be so big . . . The mixture will be quite stiff. Sometimes I've used my hands to mix everything, but this time I used a large mixing spoon, and it worked fine. Whisk together flour, sugar, and baking powder in a large bowl. 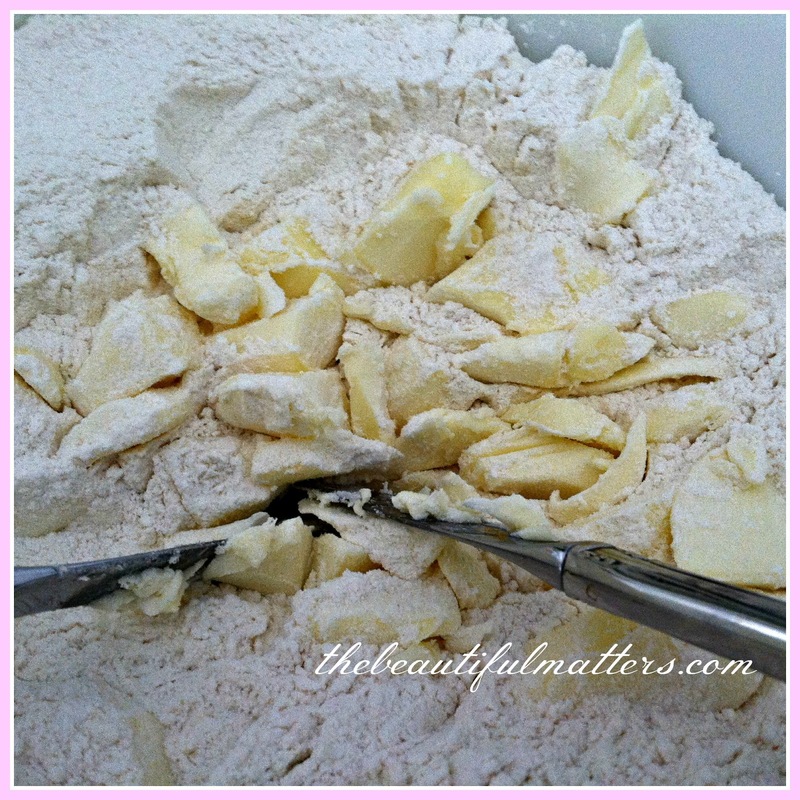 Cut butter into cubes and use a pastry blender (or two knives) to mix in with flour mixture. 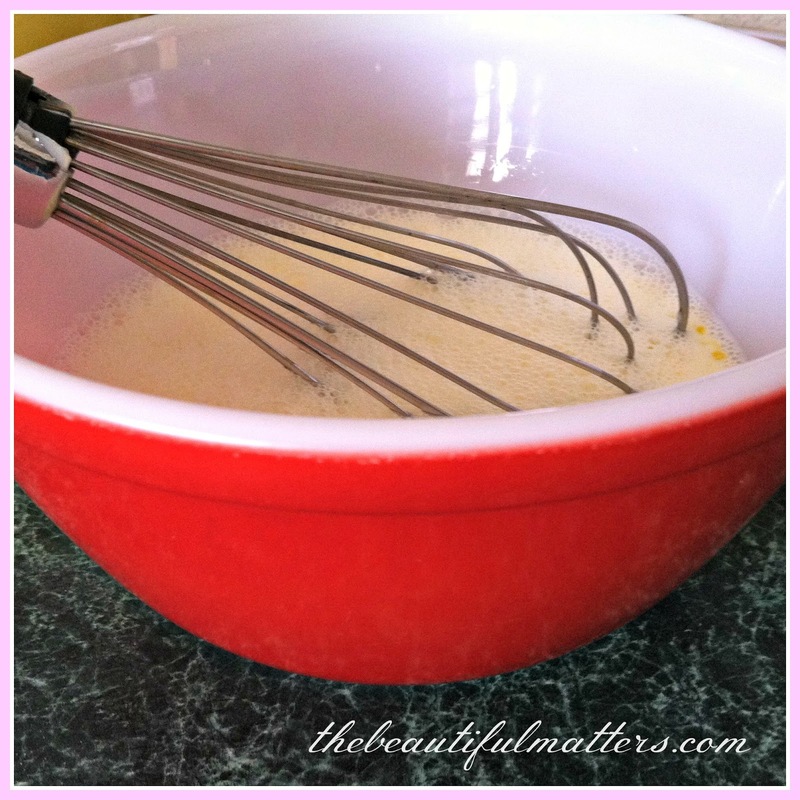 Whisk eggs and milk together in a small bowl. Add to flour mixture, and work in with hands if needed. Add fruit and nuts. Mixture will be stiff. Drop by 1/2 c amounts onto ungreased baking sheet. Brush with egg wash and sprinkle with sugar. Bake 20 minutes at 350 F. Cool on rack. Thanks, Sarah, for the recipe! I love you, too. Welcome to Foodie Friday! I've got scones on the menu for this Sunday, but after looking at your photos, I may make them today! 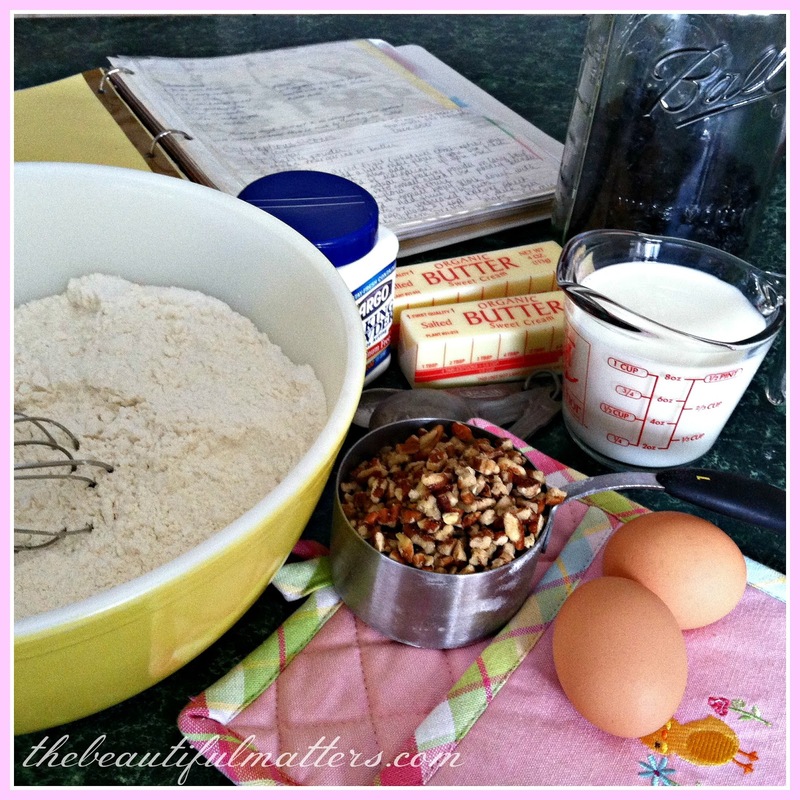 Thank you for sharing your great-grandmother's recipe--love your vintage Pyrex bowl, too. Have a wonderful weekend. Lovely pics of your scrumptious scones, Elizabeth and the recipe sounds quite doable! Will definitely give these a go! Thanks for sharing! I love a great scone! This one looks delicious! Great tips! 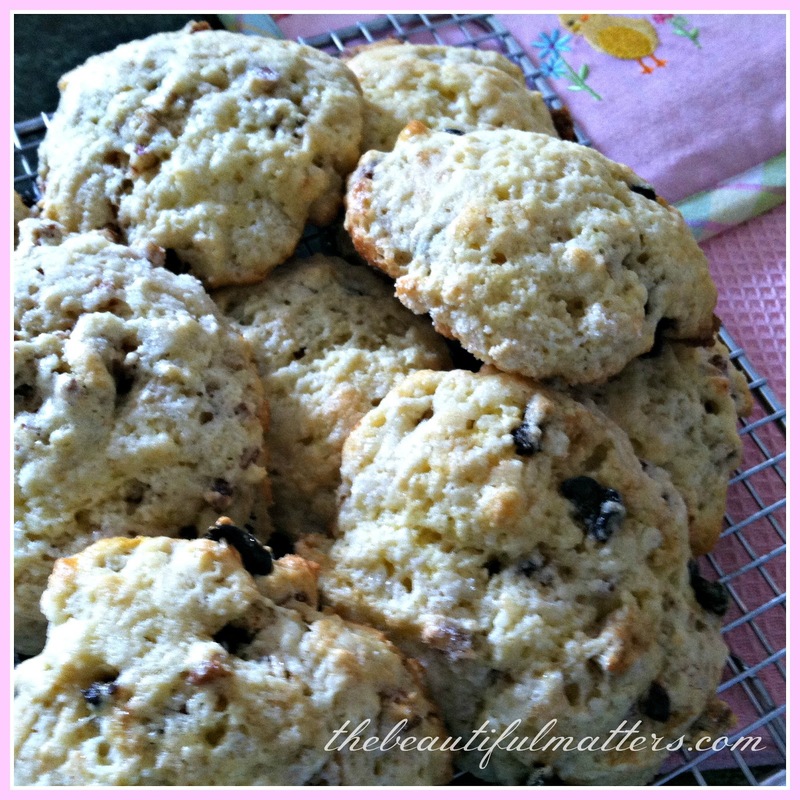 Thanks for sharing your scone recipe! It looks delicious :). A yummy looking recipe Deborah. I've tried many recipes over the years and combined a couple to arrive at a favourite. You are lucky to have your butter come in sticks instead of pound packages, we can buy quarters but they're expensive. These look mouthwatering! I plan to make a batch this week using this recipe. I assemble my ingredients, too, before I bake. Another tip I find helpful is to make a sinkful of sudsy water, first thing, when I am cooking or baking. That way, anything I want or need to hand wash can go right into the soapy water and it us so easy to wash mixing bowls, wooden spoons, or whatever as soon as you finish. That really helps me to get the kitchen back in order right away. Thank you for following my blog. Oh, I love scones sweet lady! 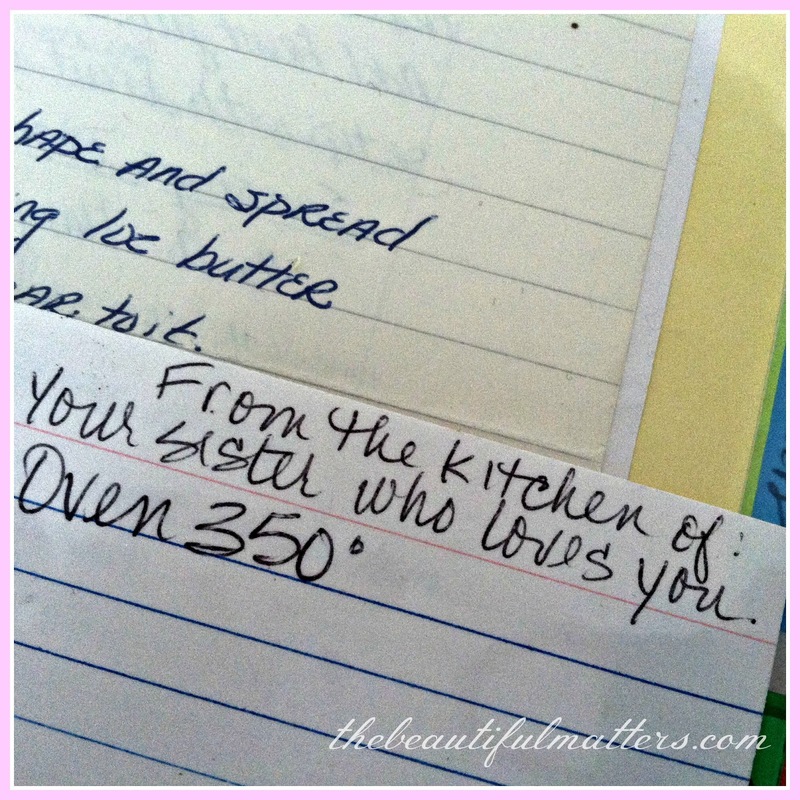 After looking at yours and the récipe, I'm copying for my next tea goodie! Wish had one or two right now with a cuppa tea! Thanks for sharing. Have a lovely and warm spring week, my friend. I have a friend and her husband who run a coffee shop at a local hospital. Don use to make the best scones. 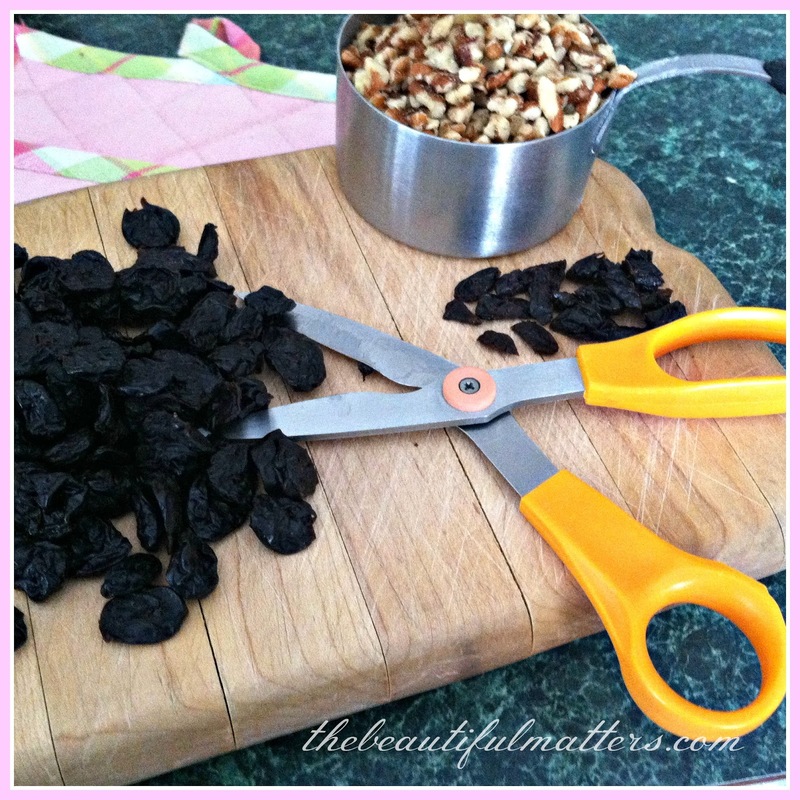 Blueberry, Pecan or Cranberry. But they were not big sellers. :-( Made me sad to see them go. Marietta was diagnosed with colon cancer. She told me when they moved to a smaller home she was going to find the recipe and share it with me. I have had a lot of recipes but I am excited to try yours. A phamiyl recipe! Amazing. I am a lover of all things tea! Thank you. Welcome to Full Plate Thursday! 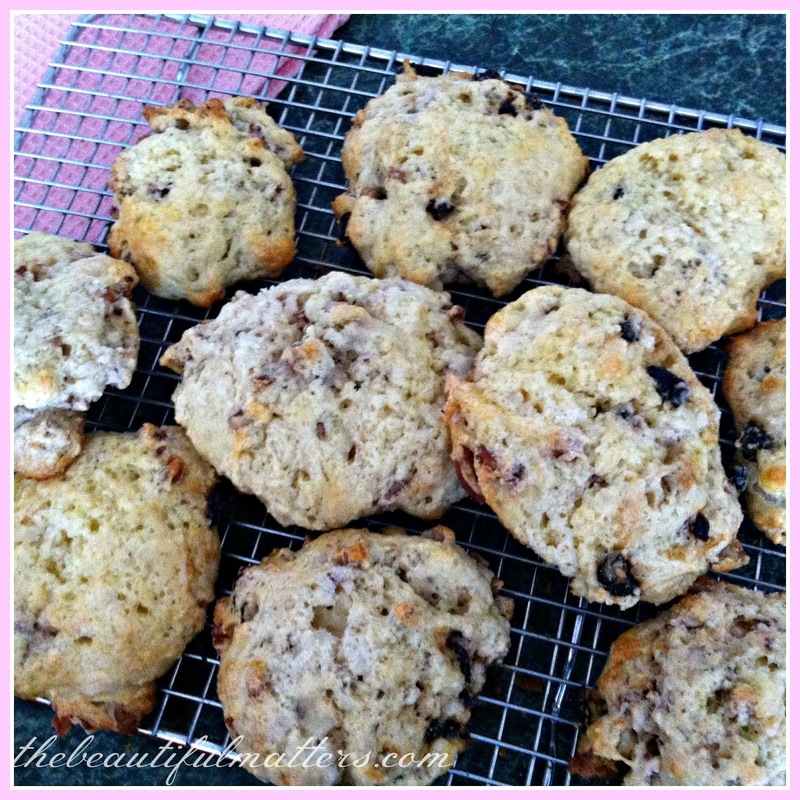 I am a scone lover and your Scrumptious Scone recipe certainly will be scrumptious and I can't wait to taste them. Thank you so much for sharing with Full Plate Thursday and have a fantastic week. Hello Deborah. Happy Monday sweet friend. Boy are we thinking the same this week. Your scone recipe looks delicious too. 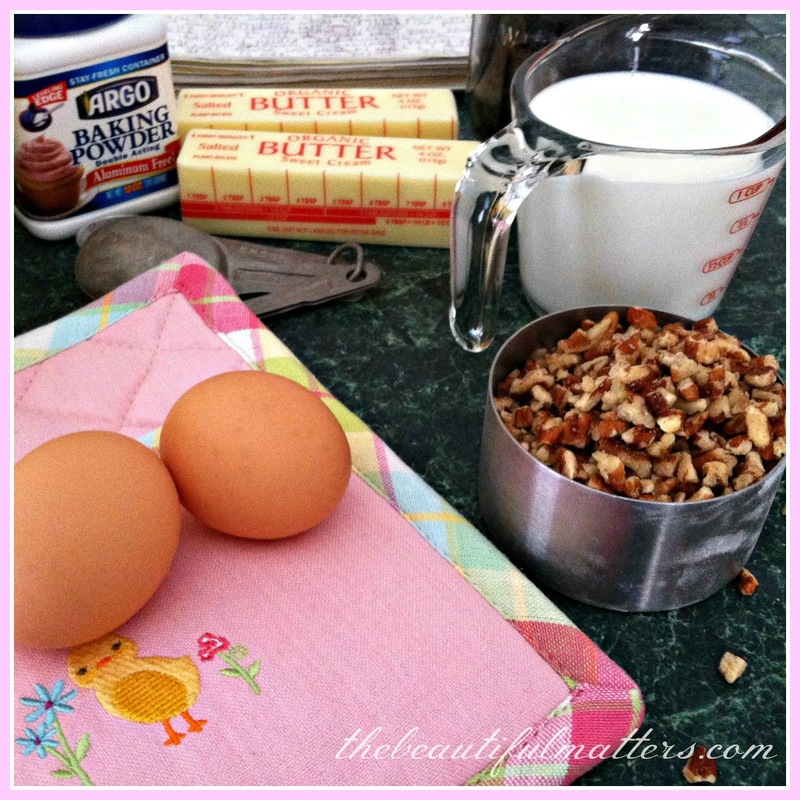 I don't have a family recipe so I just use online resources but I have to give yours a try. I do have to agree about the sugar. My recipe calls for more sugar than yours and they do turn out moist and flaky too. I switched the sour cream to buttermilk so I think that helps keep the scones moist too. PS, did you get the other china you were thinking of getting??? I am going to a few thrift shops this weekend so I know I will be in trouble. I am also going to a Downton Abbey Costume exhibit with my sister-in-law this weekend in Delaware. I can't wait. Have a great week and thanks for your support. what china? hmmm . . . I hope I got it, whatever it was!! :) Have fun at the shops and at the exhibit; sounds wonderful! Grating hard cold butter works well, and is an easy way to incorporate it into the scone mixture. Thanks for the recipe. that's a great idea! thank you. I meant Sherry not Y. Now I am SO hungry! Can you please feed me one through my screen? :) They look great. I'll have to try that recipe soon. I agree about the baking powder. I've been looking for aluminum-free for years. Glad to know about Argo. Thanks for the recipe!